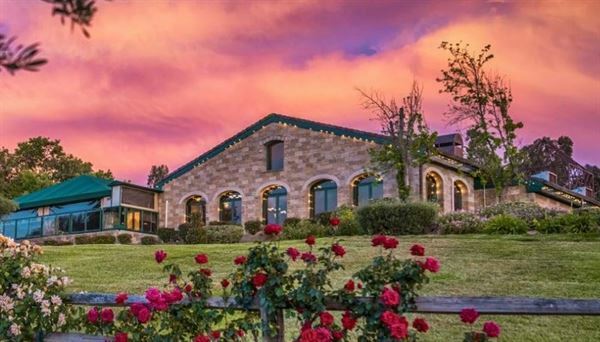 Nestled in the heart of the Temecula Valley Wine Country, Thornton Winery opened in 1988. The winery combines old world style with new world taste to create award-winning and premium varietal wine. Thornton Winery offers an impressive setting for any occasion. Private functions can be held in our elegant Vineyard View Room, our charming Champagne Lounge, our unique Production Area or al fresco on the Fountain Terrace overlooking the beautiful Temecula Valley Vineyards. Our event staff would be delighted to assist you with weddings, receptions, tours, corporate functions, fund-raisers or other events. They can facilitate the most imaginative party themes, devise sumptuous menus, and attend to the myriad of details with complete professionalism, to assure you of a successful event. Thornton’s experienced Event Specialists understand the need for perfection in each detail. We provide site coordination, menu planning, wine/food pairing, and referral service. Ceremony Package Includes: • Picturesque Wine Country Ceremony Site • Romantic and Unique Photo Settings • Set-up of Wedding Ceremony • Ornate Iron Arch • White-Wood Padded Chairs • Guest Book and Gift Tables with Coordinating Linens • Water Refreshment Table • Bride & Groom Changing Room • Complimentary Guest Parking • Professional Banquet Captain to Help Facilitate your Rehearsal and Ceremony Ceremony Only: $1000 facility fee $10 per person Reception Package Includes: • 5 Hours of Time (Including Ceremony) • Cocktail Hour Following your wedding ceremony with tray passed Hors d’Oeuvres • 1 Glass of Thornton Wine with Holding Reception • 1 Glass of Thornton Champagne for toasting the new bride and groom • Award-Winning, Four-Star Cuisine Seated or Buffet Style • 1 Glass of Thornton Wine with Lunch or Dinner • Gourmet Coffee with Dessert Service • Cake Cutting & Serving • Wedding Cake Table or Wine Barrel • White-Wood Padded Chairs • Floor Length Linens Ivory China, Stainless Steel Flatware and Glass Stemware • Professional Banquet Captain to attend to your every need • Complimentary Wedding planner to help with your planning • Complimentary one year anniversary dinner at Cafe Champagne (value up to $75.00) Please see attachment for additional information and menu options. Brunch Buffet | $49.54 per person Lunch Buffet | $54.95 per person Dinner Buffet | $62.95 per person Luncheon Entrees | $35.95 - 51.95 per person • Pasta Primavera • Baked Boneless Chicken Breast • Turkey Piccata • Chicken Romano Chicken Tortellini • Citrus Baked Sea Bass • Luncheon Filet Mignon Dinner Entrees | $52.95 - 66.95 per person • Artichoke Chicken • Chicken Saltimbocca • Pecan Crusted Pork • Champagne Poaches Salmon • Almond Crusted Halibut • Steak Au Poivre • Petite Filet of Beef & Chicken Breast • Petite Filet of Beef & Seabass Vegetarian Entrees | $39.95 - 42.95 per person • Grilled Eggplant, Portobello Mushroom Napoleon • Ricotta & Mozzarella Stuffed Shells Please see attachment for additional information and menu options.